Talia Aikens-Nunez OMG...Am I A Witch?! April Appleton is so annoyed at her older brother that she searches the Internet for a spell to turn him into a dog. When the spell works, April realizes she has more powers than she ever dreamed of! Now she has to figure out how to turn him back to normal before her parents find out. 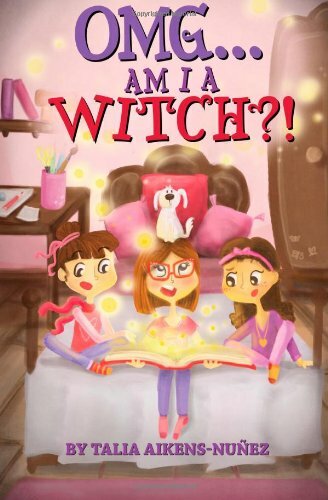 She has little time, but with help from her friends Grace and Eve she finds a book of magic that will hopefully reverse the spell. Will it work, and will April’s newfound magic save the day? Talia Aikens-Nuñez wanted to be a meteorologist, a politician and a lawyer. It was raising her bilingual children that inspired Talia to write multicultural children’s books. Her family loves nature so much that she and her husband vowed that they will always try to live close to water, so now they live on a river in Connecticut. 1. OMG. Am I a Witch?! 2. OMG.Am I A Witch?! 3. OMG...Am I A Witch?! 4. OMG...Am I A Witch? !